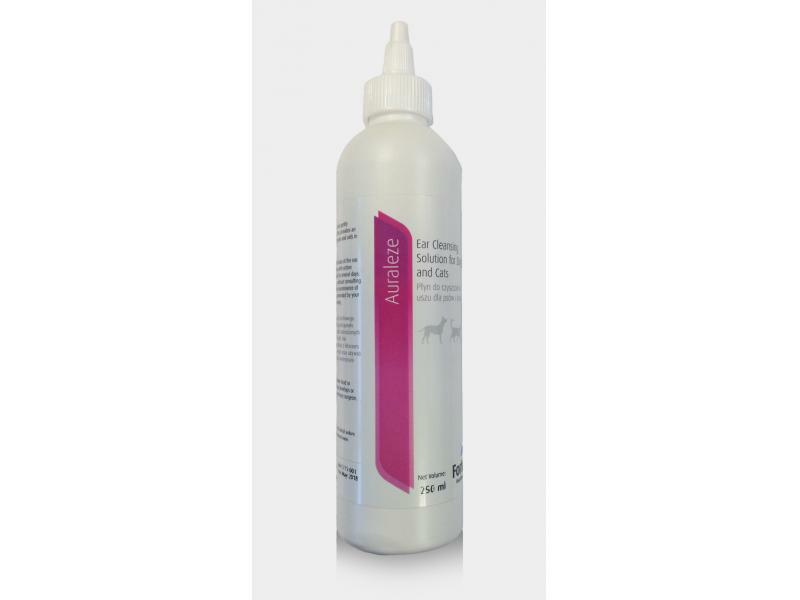 Auraleze Ear Cleansing is a specially formulated cleansing solution, acting to clear, dry and deodorize the delicate ear canal, removing wax build up and reducing inner ear swelling all whilst maintaining a pleasant scent. Denatured alcohol, lactic acid, benzoic acid, salicylic acid, dioctyl solution suffosuccinate, propylene glycol, aloe vera gel and deionised water. Apply liberally into the ear canal. Massage the base of the ear. Allow pet to shake head. Clean excess with a cotton ball. In excessively dirty ears: apply 2-3 times daily over several days. For routine cleaning and maintenance of healthy ears use 1-2 times weekly or as recommended by your veterinary surgeon. Always apply after swimming. Do not use for more than 7 consecutive days without consulting a veterinary surgeon. Consult your veterinary surgeon if the pet shakes head or scratches ears frequently. If redness or irritation develops or persists, discontinue use and consult veterinary surgeon. Below are some recent questions we've received regarding Auraleze Ear Cleansing, including answers from our team. Could you please confirm that this product does help t reduce inner ear swelling as I have tried to research it on a search engine and all other websites I have been on does not mention this. Also could you confirm that you can use it in the inner ear. Swelling of the lining to the ear canal is commonly a problem, usually as a result of inflammation in the area. This and other cleaning solutions reduce swelling only by their action to cleanse the ear and reduce the microbial overgrowth which is usually present. Many prescription ear treatments contain steroids and these have a more direct action to reduce inflammation and swelling, but the non-prescription ear cleaners do not act in this way. Your reference to the "inner ear" is ambiguous. If you mean the canal between the ear drum and the opening to the ear which you can see by lifting the ear flap, then this product can be used there (technically the external ear canal). The medical definition of the "inner ear" is much deeper than that and this product should not be used past the ear drum (eg if it is ruptured by trauma or infection) but that is probably not the meaning of your question.